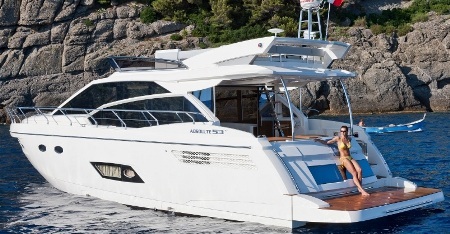 Absolute presents the new 53 Fly which is a further development of the 50 model of the same line. The Absolute 53 Fly main modifications versus the 50 are quite a few and are to be found in all areas from increased cabin height, larger opening side windows, different more aggressive looking bathing platform, larger aft crew cabin with large view window, more extended larger flybridge in length by seventy centimeters, galley reconfiguration with additional cabinet, modified saloon settee with increased seating capabilities, and internal helm redesign now offering better ergonomics with better all around view. Some options seem also to have vanished from the Absolute 53 Fly technical data of the official website versus the 50 model, like the option of the two cabin layout with owners stateroom moving to midships, and the choice of only twin or triple Volvo 435hp engines with IPS pods propulsion, removing the small 370hp.